A guide to personal spiritual renewal for those who feel disconnected from God, faith and transcendent purpose. Drawing on the well-known story of the prodigal son, the author shows how most people set out with good intentions, only to find themselves floundering in what he calls "spiritual amnesia." He dares readers to accept a 30-day spiritual challenge by praying each day, "God, if you are real, make yourself real to me." Then he walks readers through the five crucial awakenings that take them from doubt and confusion to love, purpose and meaning. About "Finding Your Way Back to God"
:"God, if you're real, make yourself real to me." Each of us spends our lives on a journey toward God. Yet often our most deeply felt longings-for meaning, for love, for significance-end up leading us away from, instead of toward, our Creator and the person he made us to be. Finding Your Way Back to God shows you how to understand and listen to your longings in a whole new way. It's about waking up to who you really are, and daring to believe that God wants to be found even more than you want to find him. It's about making the biggest wager of your life as you ask God to make himself known to you. And it's about watching what happens next. 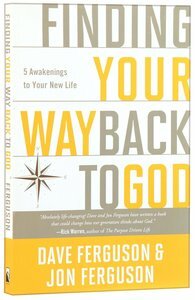 Dave Ferguson dreams of helping all people find their way back to God. He writes to inspire, instruct and collaborate with others who share this dream. To see that dream realized he uses his influence and creativity to catalyze a movement of reproducing churches. Toward that end de serves as the Lead Pastor for a remarkable group of Christ Followers called Community Christian Church and provides visionary leadership for NewThing, a global network of reproducing churches. Jon Ferguson is the cofounding pastor of Community Christian Church - a multi-site church in the Chicago Metro Area. He serves as teaching pastor and leads the Strategic Team of staff champions for adult, student, children's, and creative arts ministries across all CCC locations. Jon is the cofounder and movement architect of NewThing, whose mission is 'to be a catalyst for a movement of reproducing churches.' He also serves on the boards of the Exponential Network and Stadia East and is an adjunct professor at Wheaton College Graduate School in the Evangelism and Leadership Department. Jon previously coauthored The Big Idea with Dave.